Not to mention independence and revolution! Very, very early on the morning of September 16, 1810, Miguel Hidalgo y Costilla, the well-read priest of Dolores, Guanajuato, stood on a balcony in the dark and delivered his impassioned El grito de Dolores (the Cry of Dolores) for independence from the gachupines (Spanish-born oppressors). Hidalgo’s declaration of independence was steeped in the thinking of the French political philosophers Jean Jacques Rousseau (1712-78) and Voltaire (nom de plume of François-Marie Arouet, 1694-1778). While the American Revolution (1775-83) was philosophically based on Enlightenment ideas, they were largely expressed in English terms; it was the cries of “liberty, equality, fraternity” in the French Revolution (1789-99) that gave life to the Mexican War of Independence (1810-21). Remember that Napoleon had invaded Spain in 1808 and occupied it until 1813, so, courtesy of the French, 1810 looked like a good time to confront Spain. Fighting dragged on for over a decade, but when it was all over, Mexico was an independent constitutional monarchy with Agustín de Iturbide serving as “emperor”; since that was not the outcome most people had been working for, de Iturbide was overthrown a year or so later by Antonio López de Santa Anna, who set up the Republic of Mexico. The French aura surrounding the War of Independence led to some serious immigration from France (before that, Spanish rulers had prohibited immigration from countries other than Spain). In the 1830s, France tried to set up a couple of colonies in Veracruz; they weren’t all that successful, but a good number of French people settled permanently in Mexico. By 1849, the French were the second-largest immigrant group, after the Spanish themselves. French entrepreneurship in Mexico brought on the First Franco-Mexican War—also known as “The Pastry War” (Guerre de Pâtisseries). In 1838-39, King Louis-Phillipe sent some ships to blockade the port of Veracruz, cutting off all Mexican trade with Europe. The goal was to impress on Mexico the idea that they needed to cut down on post-war unrest (there were 20 different presidents in the first 20 years of the Republic). All that chaos had led to the looting of a Mexico City pastry shop (an interesting story in itself), and Louis-Phillipe decided it was time France collected for all losses suffered by all French businesses in Mexico, along with some war debts stemming from French aid during wars in what is now Texas. Basically, Mexico lost, Britain negotiated a treaty, and Mexico paid France. With some detours through a dictatorial presidency by Santa Anna and territory-grabbing by the U.S., Mexico ended up in debt to France again, which, who knows why they would, had once again come to Mexico’s assistance. However, then-president Benito Juárez declared a moratorium on paying foreign debts; France, Spain, and Britain invaded; Spain and Britain dropped out when they learned France was hell-bent to take over the whole country, which they did in 1862. Before they did, though, they suffered a defeat—en route from Veracruz to Mexico City, they were met with resistance. Led by Ignacio Zaragoza, Mexican forces occupied fortifications in Puebla. The French were unsuccessful in their attack, and were routed into complete retreat on May 5 by a young cavalry officer named José de la Cruz Porfirio Díaz Mori. 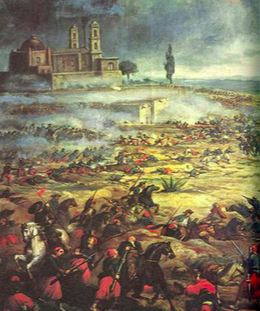 Although the battle provided only a temporary halt to France’s victory over Mexico, it became known as “Cinco de Mayo,” and like the battle itself, isn’t a very big deal in Mexico. Porfirio Díaz, however, was a big deal, and more about him later. By 1864, the French had installed Ferdinand Maximilian Joseph, an Austrian archduke from the Habsburg monarchy, as Emperor Maximilian I of the Second Mexican Empire (Iturbide’s brief rule was the First Mexican Empire). Some stories have it that his wife, the Belgian princess Charlotte/Carlota, pressured him to take the job, which he didn’t want. If so, Maximilian’s instincts were right; in 1867, he was executed by a Mexican firing squad as Benito Juárez led the uprising that liberated Mexico from foreign rule. Juárez remained as president, defeating Porfirio Díaz in the 1871 election, until he dropped dead at his desk in 1872. Díaz began making moves to return to power. In 1876, he succeeded, and embarked on what was effectively a dictatorship (the “Porfiriato”) until 1911, with a little break from 1880-84 to give the semblance of presidential elections. He managed to maintain office by catering to the conservative wealthy and, not incidentally, the French tastes they developed courtesy of Maximilian. When he was finally overthrown in the Mexican Revolution, Díaz fled to Paris; he died in 1915, and is buried in Montparnasse Cemetery. Despite their ignominious ends, Maximilian, Carlota, and Porfirio Díaz are responsible for lasting French influences in Mexico. Maximilian brought 19th-century French urban design to Mexico City. Paseo de la Reforma connects the National Palace with Chapultepec Park, and could have been designed by Baron Haussmann, who laid out the Avenue des Champs Élysées in Paris. Remember the neoclassical Beaux Arts movement? That would be the Palacio de Bellas Artes. In Mérida, the Palacio Cantón was built during the Porfiriato and now houses the Regional Museum of Anthropology and History. In Orizaba, none other than Gustav Eiffel designed the Palacio de Hierro, a Neoclassical/Art Nouveau ironwork structure that was to serve as the municipal palace (today it houses offices and a series of small museums—soccer, beer, flags, ex-presidents, the “Roots of Orizaba,” the geography of Orizaba, and a planetarium). Eiffel also made it over to Baja California Sur to the small city of Santa Rosalia, to design the cast-iron Iglesia de Santa Bárbara, mostly notable for its interior barrel-vault ceiling. Throughout Mexico, you can also see stunning examples of Art Nouveau architecture, courtesy of France, and the immediately succeeding Art Deco, courtesy of any number of countries, including the U.S.
Mexico’s first classic cookbook, El Cocinero Mexicano, was published in 1831 and is planted firmly in the tradition of classic French cuisine—despite its claims to serving up the best of Mexican food. (No one was going to publish a cookbook for indigenous food—that was for the lower classes and cookbooks were hardly necessary.) The continuous state dinners prepared for Maximilian, Carlota, and guests, would have been indistinguishable from over-indulgent 19th-century French banquets. Today, huitlacoche crepes, various mousses, cream soups (carrot with cilantro, perhaps mushroom with epazote, anyone? ), and of course, those pastries and some desserts remind us of the French presence in Mexico. Even before the arrival of Maximilian and Carlota, French fashion made inroads on Mexican taste. Starting as Las Fábricas de Francia in the 1850s (not the same as the current Fábricas de Francia, which is part of Liverpool), Frenchman Victor Gassier began building the fashion emporium that finally opened as El Palacio de Hierro in 1891. Although that building was destroyed by fire, and the store had problems during the Revolution, it reopened as the Palacio de Hierro in 1920 in a new Art Nouveau building (French architect, of course) in Polanco, complete with two stained-glass ceilings done to match ones in Nancy, France (a center of Art Nouveau architecture). That building reopened in 2016, boasting a $300 million (USD) renovation and another 594,000 square feet of floor space. As you could during the Porfiriato, you can spend big bucks on the latest fashion from France: Chanel, Hermés, Louis Vuitton.